In celebration of Exoticskis.com’s review of Northland Skis, Northland is offering special pricing for ExoticSkis.com readers. Type promo code: "Exotic" to receive special pricing on a new pair of Northland Skis at the on-line shopping cart checkout. Note: ExoticSkis.com receives no compensation, payment, revenue-sharing or other benefit from this offer. Northland wanted to offer ExoticSkis.com readers a discount to celebrate the review of their skis on our site, so we thought anything that saves skiers money on getting new skis is a good thing! The Northland brand of skis began in Minnesota USA in 1912, becoming an industry-leading ski company early-on, then ran for nearly 60 years until its demise in the 1970s. Peter Daley acquired the rights to the brand and trademarked it around 2014 to begin producing a hand-crafted series of specilized carving skis in 2016. Peter and his son Peter (jr) now craft their high-end dedicated carving skis in three diferent lengths in Steamboat, Colorado USA. The Daleys had years of experience creating skis before they created their Northland brand. Northland Ski Manufacturing Company got its start in St. Paul, MN in 1912. Northland has been credited as the catalyst in creating America’s love of skiing. Many skiers recall Northland’s being their first pair of skis. From its earliest days, Northland was committed to the quality of their skis and to the sport of skiing. The copy from an 1944 ad read, “When you buy Northlands you buy the finest – for Northland’s are indeed the choice of champions. Whether you are a novice or expert be sure your skis proudly wear the Deer Head trade-mark of NORTHLAND, because the better the skis, the better your skiing.” Northland skis were the skis of choice for Olympic skiers as they were widely known for performance and unsurpassed quality. Beginning in the 1920’s Northland published some of the first how-to-ski pamphlets – selling them for $.10 a copy. These manuals were an instant hit with American skiers. Soon Northland became the largest manufacturer of skis in the world. A series of factory fires (a common hazard for woodworking factories in the early days) caused Northland to move to different locations over the years. Later materials and technology changes knocked Northland off skiing’s manufacturing pinnacle. Today, Northland is back. We are building handcrafted wood skis designed for carving in the heart of Ski Country USA – Steamboat Springs, Colorado. Sometimes a thing is built with an inherent purpose in its form. All cars are meant to transport you from one place to another. But then there are cars that are meant to be driven. They are meant to exist beyond the purpose of transportation. They are meant to be let loose, pushed hard, driven fast, with unprecedented performance. They are more than a means of transport. They develop a connection between operator and road, fostering a synergy between two warring elements. A car like this begs the user to fly into turns, and with such trust it grips the road, and at the end of the turn propels itself forward with acceleration. Some things are just built, but some things are built for purpose. Northland Skis are built to carve. It is our purpose, with each ski created, to provide the ultimate thrill ride down any terrain. Due to its aggressive full edge sidecut, they are a ski that thrives when placed on edge, never wavering in its grip of the snow, regardless of terrain. They dare the rider to push into the next turn a little harder, knowing full well they are more than capable to handle whatever is thrown at it. Our layup construction, like a well tuned suspension, is designed specifically to target multiple elements that may face the user. Our Tri-Wood core, combined with a full length layer of kevlar absorb and deflect energy and reverberations that often come from higher speeds while on skis, creating a solid, and incredibly smooth platform for the user. The stability of the ski urges the user to open them up to higher speeds, never causing a feeling of discomfort. The built in camber combines with the full length layers of triaxial weave fiberglass and carbon fiber to create the perfect flex when the ski engages in a turn. The camber flexes when pressure is applied, and then when pressure is released, the ski snaps back to its cambered form, causing a smooth, yet playful transition out of the turn, propelling the skier from one turn to the other with power and grace. Beautiful wood veneer topsheet and retro-style branding badge logo. Full-wrap 360 degree edges, hardwood sidewalls, stout flex, LOTS of camber. Spoon-shaped shovel and flat, broad tails. Excellent fit and finish quality with alluring "small-batch" look and feel. Somewhat heavy feel. Damp response to hand flex and gong test. The Northland carving skis have completely different personalities in these two lengths we tested. They are not merely shorter and longer lengths of the same ski. Northland's skis are hand-crafted, small-batch frontside hardpack carving specialist tools delivering stunningly great performance at a somewhat premium price of $1,,500. The retro-look hides some top-shelf carving capabilities in a damp, yet energetic chassis guaranteed to impress hardpack experts, ex-racers and technical arcing geeks. While most small, craft ski builders concentrate on freeride and powder designs, Northland has locked in a position as one of the supreme carving ski producers in the alternative ski universe. The 168cm size is a highly-cambered, hyper-carver (11 meter radius) with instant response and "pay attention or you'll end up in the back seat" acceleration with a vicious, biting grip on the surface. Eastern hardpack afficianados will instantly light up big grins after just two turns on the Northland 168. "Wow" is what every tester said after getting their first rides on the 168. This thing is jack-rabbit quick, intensely rock-solid in its edgehold and packs a punch. It needs to be on-edge and does not tolerate being smeared or thrown sideways, and dislikes running flat for a long time. This is a get-it-on slot-car excercise machine to reveal how rusty your technique has become riding all those rockered freeride skis too long. Addicting like an exotic sports car and just as likely to seduce you to exceed your ability to pilot it at extreme speeds. One of our testers (Brian) did not like the personality and performance of the 168cm version (see his comments below). Tne Northland 168 is a no-holds-barred, highly cambered Euro sport carver meant to change direction on hard surfaces instantly and powerfully with a savage grip underfoot. On hardpack and boilerplate surfaces, the 168 telegraphs the details about the surface to the skier in detail, but not harshly, and will immediately start coming across the fall line as soon as you tip the ski on edge and let your weight pressure the ski. It rewards a centered-pressure technique and will punish lazy skiers in the back seat with trip to the weeds if they don't pay attention to what this ski wants to do. Like any great SL ski, the 168 will instantly bite underfoot and along its entire length, loading up tension in its flexed state as it travels across the surface until you release it to jettison forward along your trajectory. Pay attention and stay centered and you can bang out turn after turn of increasing intensity until you drag your hip left and right enough times to cry "Uncle" and ease up on the workout. The nice thing about the shaping of hte 168 is its quick and easy turn intiation which differs from some SL race skis which require you to maintain a vigilant pressure to get them to engage their best. Northland has obviously spent some time prototyping shapes and cambers to get this personality from their product. "Ricochet Rabbit" is the best way to describe the Northland 168 carvers. The high camber means it does not tolerate scrubbing speed with a smear or slide, so forget the surfy-drifty feel of your rockered all-mountain or freeride skis and pay attention to what you are doing. You wouldn't take one hand off the wheel of a Ferrari in the middle of your turn, and you shouldn't get lazy with your technique on the Northland 168s during intense carving either. These are helplessly addicting for carving freaks and racer-types. Totally fun and intense. Watch your speed on the hardpack or you'll find the 11 meter radius will bite you. "I got the ski them for a few runs in both a race mood and a crossover bit. The results were quite similar. I struggled initially to get the turns to initiate and then I felt kind of skitterish. The best tactic was two euro carve with them and wait till the absolute last moment before tossing my body across the hill again. This is an indication of their extreme roundness sidecut. I think it’s a little bit too round. The skis don't track exactly flat when not given input and when on edge need to be on an extreme edge. In this manner, Euro carving was the way to go." The Northland 178 is one of those ideal carving tools for firm groomers and hardpack first thing in the morning when there's no one on the wide-open, freshly mowed terain. The 178 is more mellow than a race ski, but superbly inspiring in high-pressure turns with a silky turn geometry and a tenacious grip underfoot. While the Northland 168 is a hyper two-seater sports car, the 178 is a high-powered touring coupe on hardpack. The same level of high-quality, but nicely-filtered feedback about the surface underfoot comes from the 178 as the 168, but its spread out over a longer running length with less camber, making this ski more comfortable than demanding. You can crank out 13 meter radius turns naturally, but the 178 is completely happy arc-ing longer, GS-sized turns on the hardpack with complete confidence and elegant behavior with a rowdy acceleration when you want it...just less explosive than the 168. The Daleys have created a classic frontside carver with excellent handling and excitement in a retro-looking style. The 178 has a distinctively "Euro carver" feel to it (whatever THAT means...but there you have it...) and was impressively fun. The pair we tested had two seasons on them and they felt like they were brand-new. The 168 really doesn't like mixed surface conditions that are too deep. You can play pothole-dodging ping-pong in cut-up conditons in the afternoon since they are so darn quick and energetic, but the ride is a bit rough and intense and you might sink underfoot hitting soft snow. They really are meant for hardpack only. The 178 is more versatile, and actually does a nice job in mixed surface conditions shy of powder. It is rock-solid stable cutting across inconsistent snow, only getting a bit sink-y when the snow is soft and more than 4 to 6 inches. The narrow waist is something you can't really overcome, but the 178 prevents deflection and has a superbly stable line-tracking integrity through junk, so it will make lots of people happy who are willing to ride an 80mm ski in soft conditions. Neither ski was good in powder (as you might imagine), being too stiff and thin to plane reliably and navigate without sinking. The 168 has instantaneous turn intiation, rushing to get through its apex and finish with a rock-solid tail with tons of energy. Pay attention or you will go for a ride. A really fun ride. The 178 has a more nuanced, more silky and patent turn initiation than the 168. It has a classic "the more you give it, the more you get" feel to it as you increase edge angle and pressure levels during your turn. The 178 shows Northland has spent some time fine-tuning the geometry to get this nicely balanced carver to initiate gradually, but confidently into a rock-solid grip underfoot and extended finish off the rear section of the ski. Acceleration and power is authoritative, but not abrupt or surprising. Some skis have a bias toward their forebody in turn initiation and follow-through, others concentrate their action in the tail section. The Northland 178 is well balanced throughout the entire length when pressured through a turn, which is a great feeling. The Northland 168 is like an exotic sports car: hold the wheel with both hands and be vigilant as your speed increases. No leather interior...just carbon fiber and molded resins. Bring your driving gloves and driving shoes. The intensity is addicting and induces endless grins. Your face will hurt after several runs. The Northland 178 is like a high-end sports coupe...powerfully silky prowess with a comfortable ride. Classy with a leather interior. You don't need gloves to drive it, but you might want to bring them anyway. "Back in the mid 90s my folks had a house in Cooperstown New York and on one trip to go see them I came across a board hardware store. Kind of a throwback for even mid 90s but they had a number of old skis the renewal stock and a bunch of wax and literature. I ended up purchasing a pair of North lands from the mid 40s that were absolutely pristine and some catalogs and some waxes. Initially I thought they go over fireplace but they were so beautiful that I decided I want to ski them. I brought them into the tune shop at Hunter Mountain where I was coaching the FIS racers and some Academy kids. I asked the manager to consider helping me about them and he became so obsessed over the ski is that over the next six months he beat me down to the point where I eventually gave them to Kevin. Kevin was the type of guy who was us before we were us. He was holding on to pristine pairs of downhill skis in the 220 range and was one of the first guys I ever saw seeing the Seth in a 207. He was also rockin boots that were as retro as the mid-80s Grand Prix‘s and Raichles. Kevin ended up putting them into his quiver and nothing made me happier. When I got contacted to try out the new Northlands-I am mediately thought of the beauty and the namesake in the old catalogs. Visually the skis did not disappoint they reminded me of the boards I picked up decades ago in terms of their beauty in construction. I got the ski them for a few runs in both a race mood and a crossover bit. The results were quite similar. I struggled initially to get the turns to initiate and then I felt kind of skitterish what settled on being the best tactic was two euro carve with them and wait till the absolute last moment before tossing my body across the hill again. This is an indication of their extreme roundness sidecut. I think it’s a little bit too round. The skis don't track exactly flat when not given input and when on edge need to be on an extreme edge. In this manner, Euro carving was the way to go. I am super stoked that they decided bring this brand back. I think it’s hard to evaluate this pair because there are some technical elements that I would change. Mostly I would add a little bit more taper to the ski so that it exits the turn and has some more stability. That said this is a primarily soft snow oriented Carver. Kind of a spring corn fun ski. I don’t think it will excel and hard pack. There is however this weird intriguing aspect to the skis that I think holds a really solid place in the market. 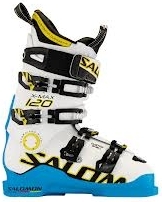 I think the individuals who are looking to have a more traditionally oriented ski that is biased toward soft snow but is not a plank will really enjoy this gear. it’s a pure aficionado ski. If you’re looking for technical carver this is not it. If you appreciate the ExoticSkis.com website and want to have a fun March and April ski this is right where you need to be. Just seen the craftsmanship in the skis made me happy and willing to forgive some shortcomings in-terms of performance. They are just classic throwback happy skis." "I love to ski on handcrafted labor’s of love. The Northland Sport Carvers are a ski that translates the language and the passion by which they were created to an expression of performance, high-adventure and integrity. Perfect for the all-mountain explorer that also likes to jump in the gates and blow the pipes out! Don’t let the laid back beauty of these skis throw you off. The understated graphics are an artistic camouflage that disguises a ski that is ready and willing to go explore every nook and cranny of the mountain the rider wants to discover. Riding the Northlands opens a fun conversation between skier and ski, ski and mountain: a symbiotic expression that is part dance on the mountain, a celebration of life, a rocket ride, and all condition companions. Northlands are intuitive, full of energy and well versed in all languages of snow conditions and geography; comfortable foraging in the trees, floating on fresh powder, staccato turns in the moguls and wide open Giant Slalom carvers on the bullet proof steeps. This ski doesn’t get placed into the quiver, this ski is the quiver." 168 is ricochet-rabbit quick and intensely addicting - pay attention to what you're doing. Nothing. Maybe offer a slighly lower-cambered version of the 168 for less athletic skiers. These are the real-deal race carvers from a craft builder you can call up on the phone. Super impressive and really cool looking. Some of the best race carvers out there. The 168 might be too intense for non-experts and the 178 might be a bit long. Talk to Northland about customizing a less intense short ski if you are not a racer-type. In celebration of Exoticskis.com’s review of Northland Skis. 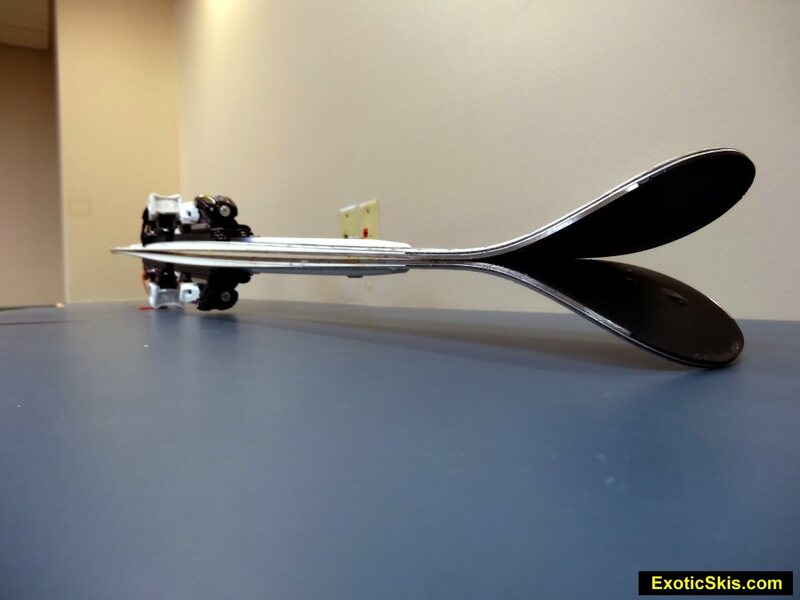 Northland is offering special pricing for ExoticSkis.com readers. Type promo code: "Exotic" to receive special pricing on a new pair of Northland Skis at the on-line shopping cart checkout. Note: ExoticSkis.com receives no compensation, payment, revenue-sharing or other benefit from this offer, Northland wanted to offer ExoticSkis.com readers a discount to celebrate the review of their skis on our site, so we thought anything that saves skiers money on getting new skis is a good thing!